You knew your steering head bearings are a wear item, didn’t you? Lately my 2012 Triumph 675 Street Triple has been having this kind of weird shaking instability when I’m decelerating, usually just under about 50 mph until maybe 20 or 30 mph, where it goes away again. The bars just kind of want to waggle in my hands, and it feels like if I let go it would get worse. I bought the bike in 2014 when it had around 10,000 miles on it, and was told it had never been down. It’s been great until just recently. It’s got 24,000 miles on the odometer now. My tires and wheels are fine, and pressure’s the same 32 front/ 36 rear I’ve always run. Any ideas? Numbers 16 and 17 on my R1 would be the actual steering head bearings, along with all the associated races and spacers and things that hold it all together. 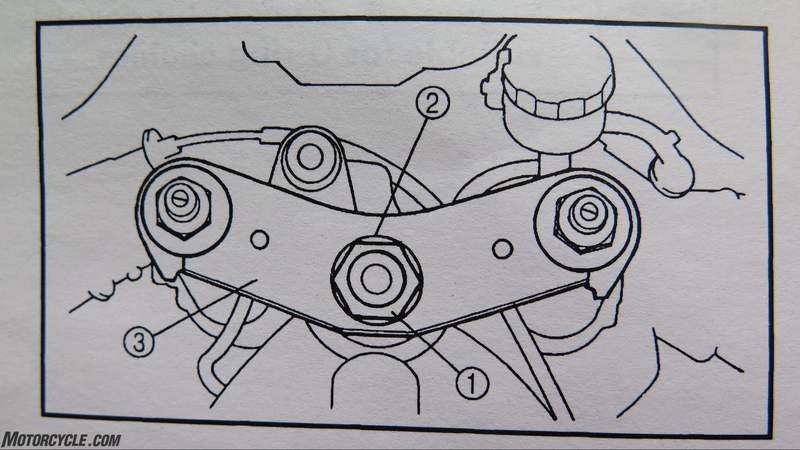 What seems pretty simple often has lots of moving parts, which is why a manual is a good thing to have. In any case, if your Triumph’s hit 24,000 miles and no one’s checked the bearings in the last 5 years and 14k miles, that’s probably your problem. 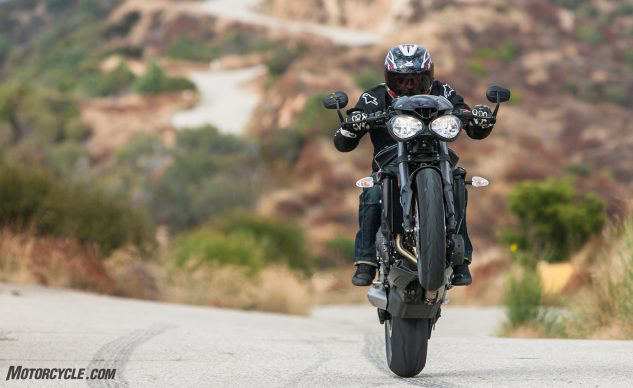 There’s an easy way to find out – which may not be that easy because you need to get the front wheel in the air. Once you do that, grab the lower fork tubes down by the axle and see if you can waggle the front end back and forth. If there’s any free play down there, the bearings need tightening. While the wheel’s suspended, also steer the handlebar from side to side. Anything less than smooth, glitch-free movement from full lock to lock is also a cry for help. Any movement more than infinitesimal is too much. If you have a friend handy who can lever the front wheel off the ground on the sidestand, you can check it that way, too. Any reputable motorcycle shop should be able to handle a steering head bearing adjustment, and if you’re able to access a good shop manual for your bike and a few tools, there’s no reason you can’t do it yourself. Again according to my R1 manual, you’re going to remove the handlebar and upper triple clamp so you can access this pair of locking rings (2 and 3 here). 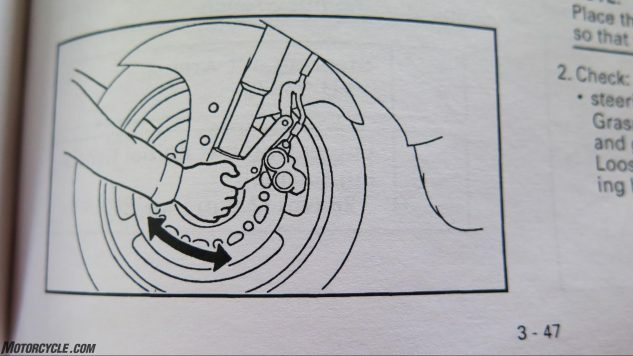 If your Triumph doesn’t use a pair of locking rings it uses something similar, and you’re going to follow the instructions and adjust the torque on those rings, which sets the pressure on the steering head bearings, to the correct spec. On my R1, you first tighten that lower ring to 20 foot-pounds, then loosen it completely, then tighten it to 6.5 ft-lb. Then you only finger-tighten the upper ring to where you can fit the lockwasher, part #1 above. What the hell? That seems too loose and you must fight the urge to not go tighter. 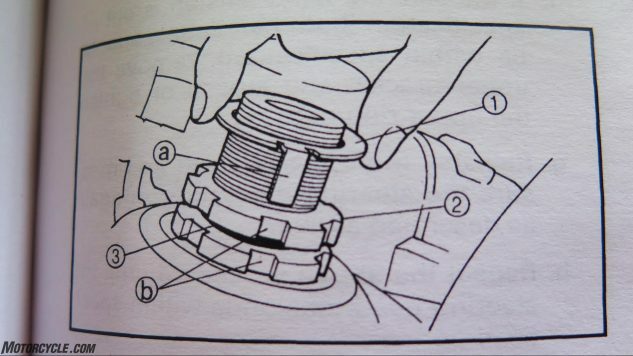 DO NOT OVERTIGHTEN THE LOWER RING NUT, the manual warns. 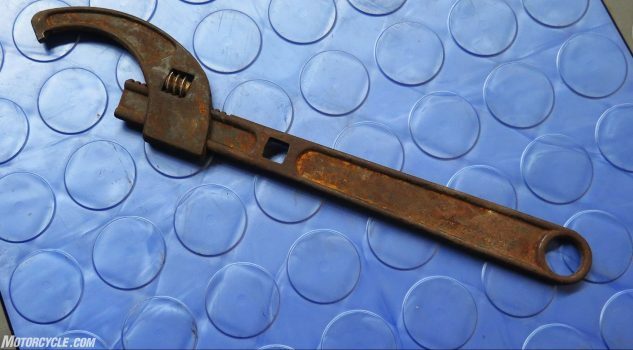 Not to panic, though: If you read ahead in the manual, you’d see that after you reinstall the upper triple clamp on top of those two locking rings, you then tighten the nut that holds it on – #2 above – to 85 ft-lb. You’ll need the big torque wrench to achieve that, 85 ft-lb is tight. After everything’s snugged up as per the manual, Yamaha sells a spring tension gauge tool you’re supposed to use to ensure it takes between 200 and 500 grams of pressure to move the handlebar. For me, that’s a little obsessive-compulsive, but you get the idea of how important it is to get it right. Too tight is just as bad as your current too-loose condition. 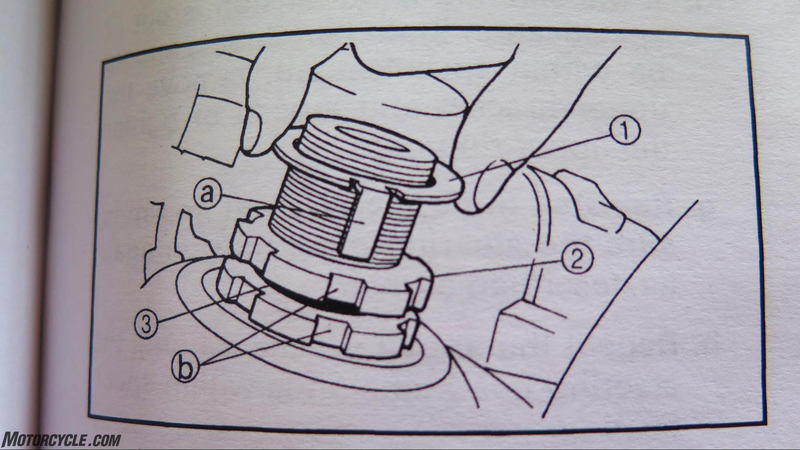 None of adjusting your steering head bearings is rocket science, but doing it by the book also isn’t always exactly intuitive. And it’s kind of important. 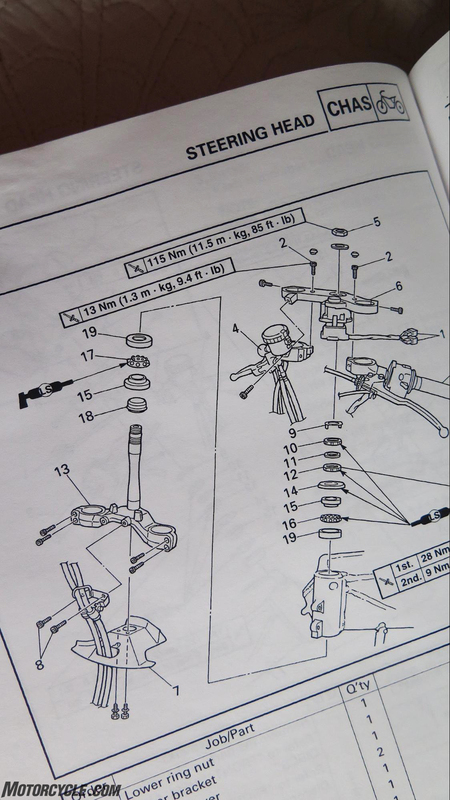 And, if you do everything by the book and you still have play at the axle, or any weird stiction or resistance when you try to turn the bars from side to side, you need new bearings instead of just an adjustment. That’s a bit more work, but you’ve come this far. Don’t stop now. Consult the manual.